This Girl's Goodbye Letter For Her BF for 8 Years Will Surely Make You Cry! Breakups are generally difficult. It is never easy to part ways from the person you love, let alone someone who has been with you for years. That is why, netizens were able to sympathize with the story of Karla Andrea Bonifacio, who shared her breakup on her Facebook profile. According to Karla, she and her ex-boyfriend Gio were together for 7 years and 7 months. Their love story started in high school, when Gio confessed his love for her when they were both 14 years old. From there, they have been the best of friends, doing everything together. They used to sneak out from their parents just to see each other. They became closer during their college days, despite being in different schools. Gio would pick her up from school almost every day, and would even help her with her projects. When they graduated and got employed things got better for the both of them. Their dates became more frequent. Karla shared that they were able to do more things and said: "300 peso pocket money became thousands, food courts became fancy restaurants, window shopping became real shopping, jeepneys became taxi, the malls became out of town & even out of the country." She also noted on how they were there for each other during their worst moments and said: "He was there when my dad passed away. I was there for him when his mom passed away too. Through happiness & pain, we got each other's back." But before the post ended, she shared that their relationship had to come to an end. Karla didn't divulge the reasons for their breakup, but wished Gio well. She said she doesn't regret loving him and that both of them deserve to love and to be loved again. 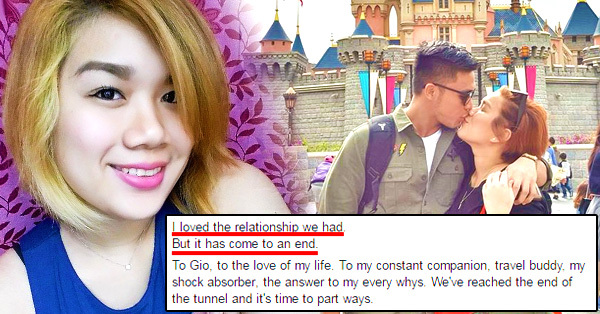 Many netizens can't help but feel devastated over the sad story. Many shared that the two of them could have been perfect, and wished that the two of them would get back together. Many were curious about the reason they ended a seemingly perfect relationship, but Karla didn't drop a single hint. The post has 117 thousand reactions and over 28 thousand shares. What do you think of this break-up story? Does this bring up any memories? Tell us in the comments section below!